Over the past couple months we have been running a design contest to help promote the Mafia Wars game. Over 100 card designs were submitted in a variety of categories including businesses, staff, weapons, vehicles and more! Users who would like to review all the card designs submitted during the design contest can visit the contest page at https://mafiawars.io/promo/card-design-contest. With so many great card designs submitted it was difficult to pick the top 3 cards, and even more difficult to pick the overall winner of the contest. After much consideration and consulting with the community, The Commission has picked the winners. The overall winner of the design contest who has won the 100,000 MAFIACASH prize is DIRTRYRAT. The second place winner in the design contest who has won the 50,000 MAFIACASH prize is LAUNDROMAT. The third place winner in the design contest who has won the 25,000 MAFIACASH prize is MAFIABANK. 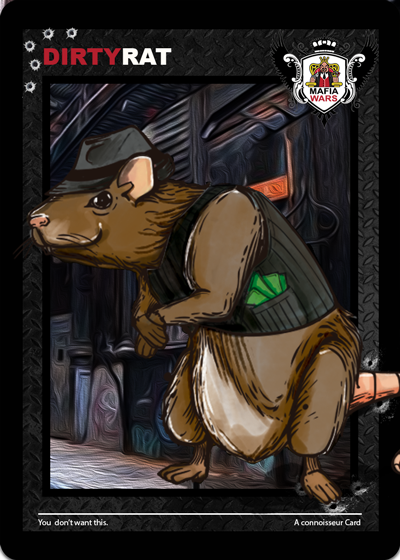 All contestants in the design contest have been paid 5,000 MAFIACASH for each approved card design.